Alongside Gotham in Batman, Metropolis in Superman, and New York City in the MCU, Sunnydale, of the Buffy the Vampire Slayer franchise, is one of those places that often raise the question to viewers; why would anyone continue to live in this town? With a constant onslaught of vampires, demons, and worse, Sunnydale seems like the last place you would want to raise a family, but surprisingly the characters seem bound to the location by some higher force. Unfortunately, that makes it our responsibility to protect them. In “Buffy the Vampire Slayer” the board game, by Thomas M. Gofton and Jasco games, 1-6 players take on the roles of classic Buffy characters, including Buffy herself, to face off against some of the big baddies from the classic TV show, and protect all the residents of Sunnydale in the process. Lets see how the game plays. To start, each player chooses a character, and takes any item cards that the player may start with. Their player standee is placed on that player’s starting location. All players are able to perform the same 4 basic actions, and each has one special action particular to their character. Players can choose or randomly select a Big Bad character to face off against, and take out a small deck of cards for that boss that represent their particular plot twists. Set up also includes decks of cards labeled items, artifacts, events, and monster of the week, as well as tokens for vampires, demons, and townies. A monster of the week card is flipped over, the monster is placed in the indicated location, and one event card per player is flipped to sorta get the ball rolling. Events place vampires, demons, and townies on the board. Basic actions that players can take are to move, fight a monster in your location, search for items, or use your location’s special ability. Players can also use their own special ability. Players will take turns performing one action at a time until everyone has used all of their actions. Performing special actions makes the group flip a new event card, adding villains to the board. When all players are out of actions, the monsters will activate, injuring the players or killing townies. It’s important to stun or kill the monsters, or to at least be in the same location as them so that you are injured instead of townies being killed. Whenever an injury occurs, or a townie is killed, a token is added to the Apocalypse Track, which, if filled up, ends the game immediately and the players lose. Injury tokens can be removed with certain actions, but townie tokens can never be removed from this track. The basic flow of the game proceeds with the characters needing to collect certain items to defeat the monster of the week. Once a monster of the week is defeated, it drops a clue token, which gives players an idea of what is needed to defeat the big bad at the end of the game. Once a monster of the week is defeated, another comes out. After three of these are defeated, the big bad is revealed for the players to defeat and win the game. I am always cautious when playing games with really strong IP’s (Intellectual Properties, meaning based on shows, movies, or other storylines everyone knows). It can be easy to enjoy the theme and confuse it for enjoying the game. Fortunately, I have never really seen the Buffy show, but have played with someone who is a huge fan of the show. Also, sometimes the makers can place most of their money and hopes in the theme, leaving little of an actual game to play. The production quality of the game is good. I like the art, I feel the color scheme is very appropriate, and the components are good quality. I like that the game can be played solo, and goes to a high player count of 6. I always enjoy when games give players that wide variety of player count. Buffy the Vampire Slayer the Board Game feels like a shorter and easier Arkham Horror. Players are moving around and juggling whether to try and search for the important items or running head first into a fight to save helpless townies. Players definitely need to work together and make group decisions, because the town can quickly become overrun with vampires and demons and nobody is paying attention to them, but without those important items, you cant progress the game. This gives the game a strong strategic basis that keeps people dialed in even when they don’t know the show. The game mechanics and game flow are very basic here. Nothing really stands out to me as unique or inspired from a gaming standpoint. Players collect cards in order to defeat small bad guys, while trying to protect townies, in order to get to the big bad guy and defeat him in a similar way to the small bad guys. I have seen it before, and am not blown away by this. Aside from this fact, I still had a good time playing the game. It’s a solid system, that works to engage the players, and there are some really fun thematic events that take place. For example, when the monster of the week called “The Gentlemen” came into play, players were not able to speak to each other until the monster was defeated. I especially enjoyed the game when playing it with fans of the show. Their excitement for the story and characters made the game way more interesting. Buffy the Vampire Slayer, the board game, isn’t a bad game in any way, it just isn’t revolutionary by any means. The game could benefit if something like a story telling aspect were introduced. I would love to see cards with text describing certain events in more detail to draw my mind into the world of Buffy, but the theme is really more seen than felt. 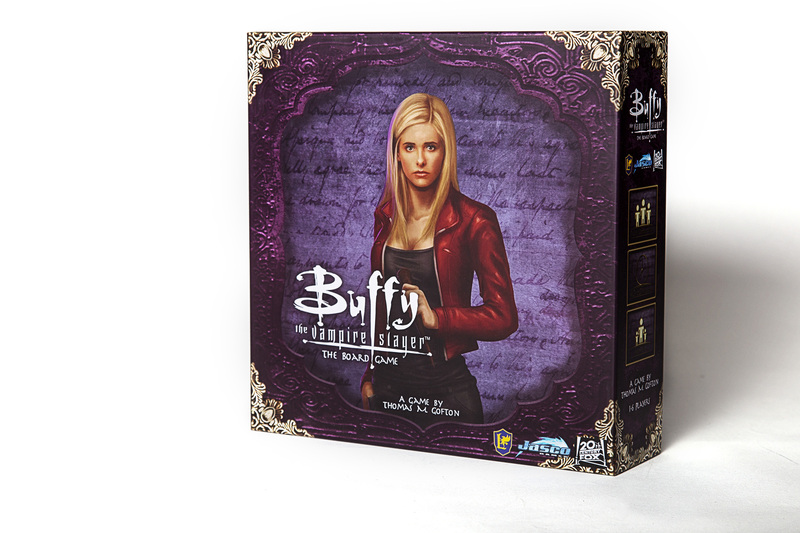 As it stands, Buffy is a board game of unintriguing mechanics mixed with a really strong IP, that I can definitely recommend to fans of the show, but would be reluctant to do so for those naïve to the show like myself. Play on boys and girls!